Reference number for this case: 15-Oct-54-Rodez. Thank you for including this reference number in any correspondence with me regarding this case. Very early this Friday morning, the Ruthenians [i.e. residents of Rodez] had their eyes and all their attention attracted by a luminous object, located very high in the sky and moving initially from East to South. Not only the Ruthenians, but many others of our compatriots, such as some inhabitants of Estain, Boussac, Bertholene, Bassin-Houiller, etc. 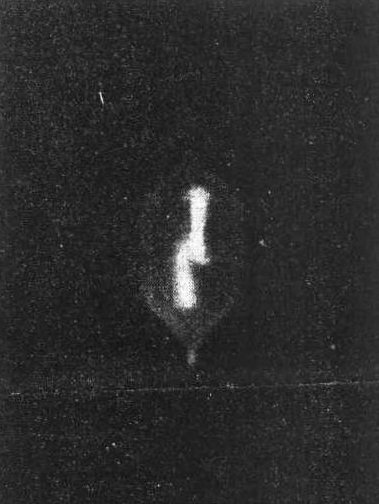 As for the comments accompanying the vision of the object in question, they were very diverse and sometimes contradictory: some described it as a sphere from which lights of color sometimes orange, sometimes red, sometimes purple irradiated; others saw it with an ovoid shape, with an appendage pointing towards the ground. In short, the interest that morning turned almost exclusively around that luminous point stitched into an absolutely pure sky like a star, but moving both laterally and in height. Was it a flying saucer? If the word was said by many, few spectators actually believed it. And it soon appeared that this luminous object was nothing but a balloon of a white color, violently illuminated by a radiant sun. To determine accurately the size of this balloon and its nature (weather balloon or sounding balloon), it would have been necessary to determine its height accurately. This seemed very difficult since the number of the altitude heard, was between 1,200 and... 10,000 meters!!! While the conversations were going on and the first interest was blunted, the balloon - as it has to be called by its name - swung as the wind blew, and by noon it was heading northwest, descending slowly. At this time, for those who had access to a somewhat sophisticated magnification device, there was no longer any doubt that it was indeed a rather large balloon, in the form of a pharmaceutical ampule provided with a single appendix. Our lantern being thus enlightened - at least we want to believe it - a secondary question arises: where did this balloon come from? When questioned, the Meteorological Center of Millau told us that every day - at 3 in the morning; at 9 o'clock. ; at 3 p.m.; and at 9 p.m. - they launch a 80 cm diameter balloon of spherical shape intended for observation of the weather. This balloon generally travels 150 meters every 30 seconds and is hardly visible to the naked eye above 500 meters, unless you follow it from the start and in very clear weather, in which case you can still see it up to 1,500 meters. On the other hand, the Center de Nîmes launches bigger radio-sounding balloons: 3.20 m. of maximum diameter and inflated with hydrogen. Is it one of these sounding-balloons coming from Nimes, Bordeaux, or... Millau, like the rumor from Villefranche sais, that traveled across the Aveyron sky? We do not know. Whatever may be the origin of this object, the moral of this little story is clear; and that is why we give it all this development: we must not confuse balloons and flying saucers! We must keep our feet firmly on the ground and be wary of the fantasies of an unbridled imagination. 1.0 Patrick Gross March 1, 2017 First published.